It's been proven time and time again. I am a sucker for the right packaging. So when I saw that the new Too Faced Sugar Pop Eye Shadow Collection had adorable -- and colorful -- macaroons all over the compact, I was totally smitten. But I told myself that while the shades inside were beautiful, I didn't really need them and I couldn't buy a palette just because it came in a cute container. I mean, even I have some limits. Of course, then I got my Ulta 20% off coupon and then my will power wasn't quite so strong. In this case, though, I'm glad that I was weak -- because this palette is a winner in my book. These days, it seems like so many drugstore makeup brands are coming out with matte lipsticks. But the thing about all these new mattes is that they're not dry and streaky and uncomfortable like the mattes I remember from my younger days. Those terrible formulas pretty much turned me off to matte lipsticks for years and years -- it's only been just recently that I've started to wear mattes again on a regular basis. The Maybelline Color Sensational Creamy Mattes are probably what started my down this road, but I think it'll be the Milani Color Statement Moisture Matte Lipsticks that will keep me on it. Now, for the record, I'm not the biggest fan of the Color Statement Lipsticks in general -- something about the scent really bugs me so I've only purchased a single shade (which I hardly ever wear if I'm being honest) -- but I decided to give the Matte version a try because I'd seen some pretty good reviews. Lately, ColourPop seems to be putting out a new collection or kit every day. Now, I'm not complaining because they're all pretty fabulous, but it's just not possible (or reasonable) to pick up all of them. I couldn't resist buying the In Bloom Collection, which was a collaboration with celebrity makeup artist Jamie Greenberg, and Where The Light Is Foursome, which is a collaboration with YouTuber Kathleen Lights, though. My will power is only so strong, you know. I was pretty bummed a few months back when Tarte's Rainforest After Dark Palette sold out. I had talked myself out of it for a long time, but I watched a few too many tutorials with it on YouTube that convinced I just had to have it in my life -- and I had a gift card to either Ulta or Sephora, which both were carrying it at the time, but when I went to buy it, it was out of stock. And it was out of stock everywhere, so I figured I'd missed my chance to pick it up. So I was seriously excited when I saw that Ulta (and Tarte's website actually) was carrying it again -- especially because I had a 20% off coupon that could be used on most higher end brands (you usually can't use coupons on those brands at Ulta). Which means I couldn't resist and treated myself to a little spring present. A couple of months back, when all the cosmetics brands were starting to release their spring and summer collections, I told myself that I was going to be a good girl and not pick anything up. I got quite a few fun new items to play with due to some holiday and birthday gift cards in the first few months of 2015, so it's not like I've been depriving myself -- but how many bright or pastel makeup products (doesn't it seem like all spring/summer collections feature those kinds of shades?) does one person need? But they're been so many good sales lately (I got the 20% off coupon from Ulta and the VIB sale is going on at Sephora this week) and I had an Ulta gift card and well, I've kind of wound up with a bunch of spring/summer makeup that I swore I wouldn't. One of the items that I had my eye on from the start and talked myself out of a half dozen times was the bareMinerals Pop Collection Ready Eyeshadow 4.0 in The Modern Icon. Over a year ago, I reviewed the Tarte Tight & Bright Eye Perfector, which I absolutely love. 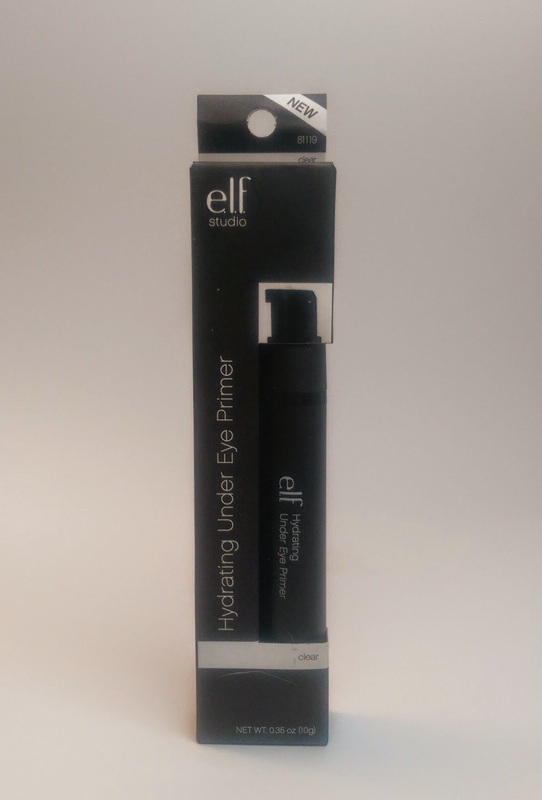 It's a dual-ended wand with one product meant to prime the under eye area for concealer and another to brighten up the area after concealer. Personally, it's really just the primer end that I love because the brightener isn't that unique a product in my book (I've got lots of concealer type things that can do that). The primer, though, does a great job hydrating and smoothing the under eye area so my concealer goes on easily and without creasing. Now, it's not a miracle product -- some concealers still do crease by the end of the day -- but my under eye concealer never looks as good without the primer as it does with it. I must have been one of the few people who enjoyed the Tight & Bright, though, because Tarte has discontinued it. I managed to snag a couple of tubes when Tarte was on HauteLook a while back, but I'm going to run out eventually. So that's why I was really excited to try the e.l.f. Studio Hydrating Under Eye Primer. I'm a big fan of the LORAC Unzipped Palette. 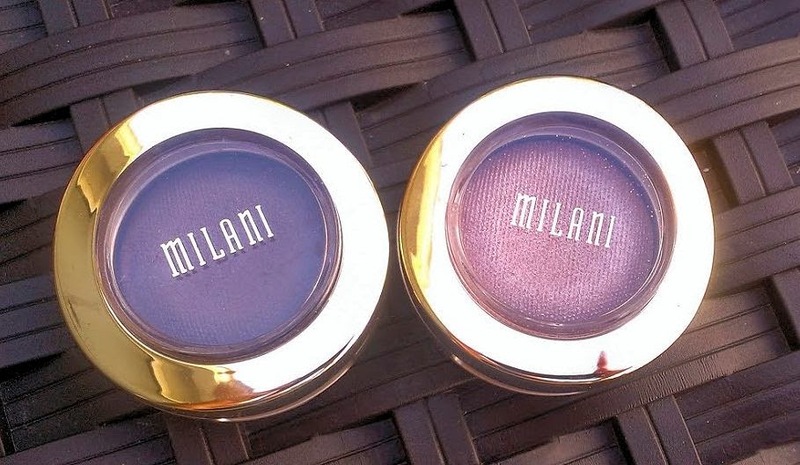 It's such a lovely collection of rosy-toned shadows, with a mix of shimmer and matte shades that allow for a variety of looks -- I probably use it at least once a week. Still, when I heard that LORAC was coming out with a second version that contained gold-toned shades, I wasn't particularly excited. That's because I'm not crazy about the way gold eye shadows look on me (Actually, I don't really like gold at all. All of my jewelry is silver.) and I've actually managed to find a couple of gold-ish shadows that I do like so it didn't seem like I needed any more. But then I saw a photo of the palette and the shadows didn't appear to be in your face gold -- and there was one shadow in particular with peachy undertones that was just screaming my name so I broke down and bought it. Every day now, it seems like a drugstore makeup brand is coming out with a new line of foundations and concealers. I'm always seeing new displays every time I walk into CVS, Target, or Walgreen's to pick up essentials, and I'm always having to work hard to resist the temptation to try each and every single one of them. Because let's face it -- I've already got plenty of foundations and concealers and many of the drugstore offerings just aren't a good fit my skin type and color. 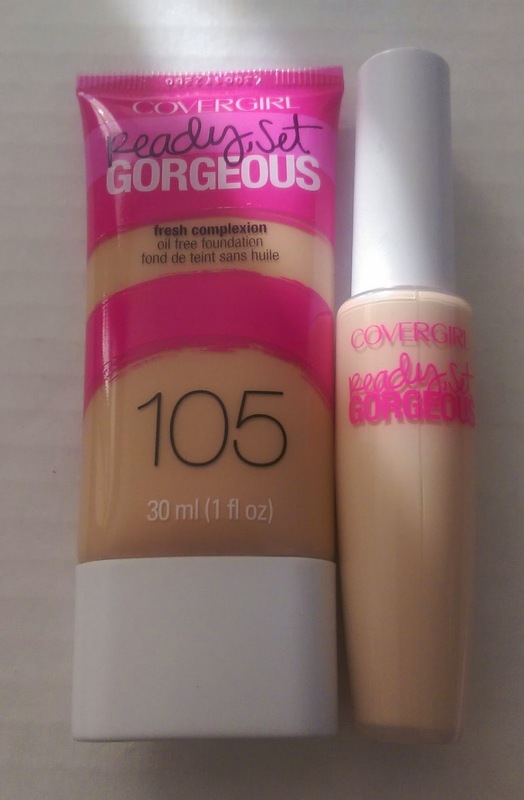 So I know the CoverGirl Ready Set Gorgeous Foundation and Concealer isn't exactly a brand new product, but I only recently broke down and picked them up.